A student has decided to take his school on with a petition to get rid of a new behaviour record system - and even his dad has backed him. Charlie Heald, 13, took action following the introduction of the 'Attitude to Learning (A2L) Record' at Trentham Academy in Staffordshire. But it is not just Charlie who is not happy about the new system. He collected signatures from around 80 students on the first day. He told StokeonTrentLive: "It's so strict now that you can't do anything at all. Pretty much everyone thinks it's stupid. "I thought, 'Well that's how things get changed in Parliament, so why not a school?' So I went into school with a notepad and pen acquiring as many signatures as I could." He says the system is excessively strict and 'hated' by pupils at the Allerton Road school. The year nine pupil said: "I am campaigning to get rid of this system because I don't enjoy it and neither do the other students. Rather than keep refusing to use the new system I decided to do a petition to make my opinion known. "I seem to be getting in more trouble since this started. It is marked down if you do the slightest thing, like your shirt is untucked or you put your head on the desk." A2L has been trialled at the school in recent weeks and will be implemented properly in September. Students have been required to carry a sheet of paper with them to every lesson, on which their behaviour is given a score. If their behaviour does not reach the expected standard they are given verbal and written warnings before being punished if it does not improve. Parents are asked to sign the record on a weekly basis so they are aware of their child's conduct. Charlie, who lives in Trentham, was overwhelmed by the support for his campaign - with around 80 pupils signing his petition on the first day. He said: "I was really surprised by how many people wanted to sign it. People I don't even know were coming up to me. "When I've got enough signatures I will bring it to the headmaster. I'm usually pretty good and I get on with the teachers but I felt like I wanted to stand up on this." Dad Tim Heald is backing his son's campaign. He said: "There are a lot of parents that don't agree with A2L. The pupils have to carry this piece of paper around with them all the time and if they haven't got it they are penalised. They are teenagers - of course they are going to lose them. "At the end of each week the parents have to sign it. It's unnecessary. Their behaviour is recorded in the register anyway and we know if he's being good or bad. It just seems daft. 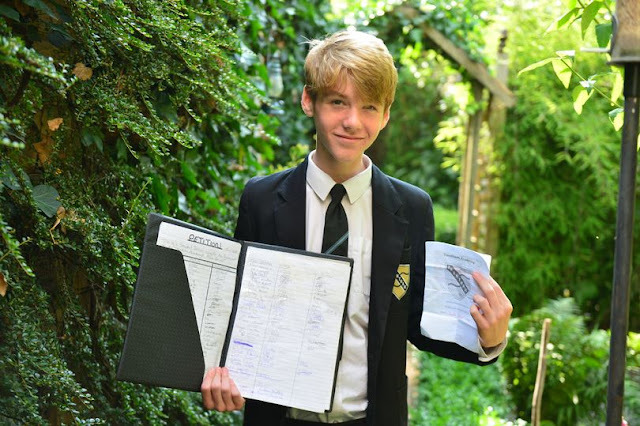 "We talked to Charlie and said perhaps there was a better way to do things than just arguing with the teachers, so he decided to do the petition. He wrote it out himself and has gone in early to talk to people about it." Trentham Academy is part of the City Learning Trust, which says the A2L system works well in its other schools. A spokesman said: "This has been run at Trentham for a few weeks before the end of term so everyone can get used to it before it starts properly in September, when pupils will have a planner as their record rather than a piece of paper. "There is a page for rewards and a page for warnings, so students can quite easily see how they are doing - it gives them a constant visible reinforcement. "Parents also sign the planner weekly so they can see how well their child is doing. "We have found this system to be really successful at other schools and the feedback we have had has been positive. "Students can have up to 10 warnings in a week. There is plenty of notice that they are not doing what they should be before they are punished."